I shed a few tears last Thursday, as The Office bid farewell and closed the book on one of the most prolific and innovative television shows of our generation. The Office had characters all of us could relate to and experiences many of us shared in a wide variety of work places. We have worked with our fair share of Andys, Kevins, Angelas, and Stanleys. We have shared professional environments with Creeds and Merediths, whose boundaries are undefined and interjections are awkward and inappropriate at best. We have loved and envied the Jims and Pams of this world. We have been amused, aggravated, agitated, and perplexed by the likes of Dwight Schrute. We may even have worked for Michael Scott. We probably are at least one of these characters. I dare you to ask your co-workers. My wife and I have been loyal fans of The Office since its beginning. So when the show drew to close and Dwight Schrute was finally awarded the coveted title, "Regional Manager of Dunder Mifflin Paper Company," I thought it was the perfect ending. That is, until the writers reminded us that every Regional Manager needs an Assistant (to the) Regional Manager. Who better to fill that role than Dwight's paradoxical nemesis and friend, Jim Halpert. Still there was more. 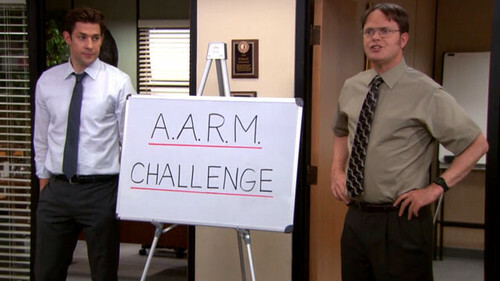 In one final Halpert prank, the newly appointed Assistant (to the) Regional Manager hosts a competition to fill the only missing piece in Dwight's "hierarchy mobile"- Assistant Assistant to the Regional Manager or A.A.R.M. But would any of the lowly office workers be able to pass the test? In premeditated Halpert fashion, Dwight wins the competition and is ultimately anointed as Jim's A.A.R.M. Dwight becomes his own assistant. Delegation is hard. Most of us live by the mantra, if you want something done right, do it yourself. We have our own Schrute-like superiority complexes that fail to entrust both the mundane and the important to others in both our personal and professional lives. We feel the need to be both architect and worker, visionary and implementer, manager and assistant (to the manager). Reality is- we cannot and should not do it all. We need to share the load and surround ourselves with those who can help craft, cast, and orchestrate our visions and dreams. We need a web of support in order to live into sustainable possibilities. This is especially true in ministry. We cannot do it all. We should not do it all. I am glad The Office ended the way it did. Dwight Schrute as both Regional Manager and Assistant to the Assistant to the Regional Manager is a failed business plan. Dunder Mifflin would not have been able to sustain this sort of mobile of command. The show may not have been able to either. But the most perplexing dilemma we all now face: what will we now watch on Thursday nights? "Moses' father-in-law said to him, 'What you are doing is not good. You will surely wear yourself out, both you and these people with you. For the task is too heavy for you; you cannot do it alone...So it will be easier for you, and they will bear the burden with you. If you do this, and God so commands you, then you will be able to endure, and all these people will go to their homes in peace.'" What are some of the best resources you have discovered for ministry leaders to implement webs of support? What resources have been beneficial for empowering those you lead in ministry to effectively cast and carry out the shared visions and dreams? What are some effective strategies and approaches to both recruiting and maintaing a broad web of support in ministry? How can ministry leaders begin to communicate that ministry does not belong to a single person or department but is a shared responsibility and call of an entire congregation and community? I shed a tear when the office finished, due to the fact i realised that we all work in the office and it became quite clear that once baby Phillip was infact Dwights even though the DNA test proved he wasnt (wow doesnt that sound like the baby we all know...Jesus?) that it was completely clear that the show is about the history and future of the world we all live in. No wonder i loved this show so much but only was it till 6 episodes on the 9th season that it was all so clear that the show is about mankind.